I felt very touched when I attended my British citizenship ceremony in Hackney last year. People from 41 nations gathered together, some having escaped discrimination for being gay, political or female in their country of origin. It was a wonderful day – I tweeted saying that it was a celebration of British values. To be frank, when I first moved to Britain, I was not thinking about citizenship. As a European, I was enjoying the freedom of movement, which I enjoyed before when I was studying for my dissertation. After a few years in the National Health Service and in the Labour party, I felt my process of integration would not have been completed without a full enjoyment of rights and responsibilities (including standing for parliament), hence my decision to apply. 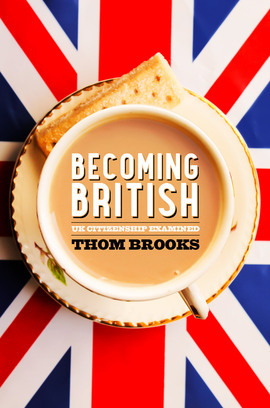 I went through the process Thom Brooks describes so brilliantly in ‘Becoming British’ – including laughing with colleagues and friends who, born and bred in Britain, did not know most of the answers to the citizenship test. We argued about dates of battles, national dishes and athletics champions. We might have not known all the answers but, ultimately, we knew what was holding us together – we were working and living in the same place, our children were going to same school; we believed in liberty, and freedom from violence and discrimination. We had endless discussions about Britishness and they were all enjoyable and light-hearted albeit profound, as you would expect when you talk about identity. Now I wonder, how many of those I spoke to back then voted to leave the EU? I asked this having been a candidate in Havering and Redbridge. I have to be honest about this – standing in the most Euro-sceptic area in England has taught me a lot. First, it has taught me that people were not (then) racist towards me. Actually, most of them never saw a contradiction between voting for me as their representative in the Greater London Authority in May, and voting to leave Europe in June. That explains how I slashed the Tory majority to less than one per cent – and yet, they voted Leave in droves. The reality is that I was not shouted at in anti-Europe Havering during the London elections, but in multicultural Hackney after the referendum. At the bus stop, I was told to go home as I was chatting with a young Romanian woman. What happened in the meantime? A horrible campaign that has unleashed deep hidden sentiments of hostility, anger and prejudice. We cannot read this referendum result without looking deeply at our country. The United Kingdom is the most unequal country in the Western European economies. Under the Tories, it has become a sort turbo-capitalistic country with little social protection, a poorer NHS and a failing social security system. Millions, who have done the right thing, played by the book, worked hard – now have little, and feel things have happened to them, and over which they have no control and no choice. For many, 23 June it appeared to be about making a choice – and for the first time. It was a choice based on feelings of resentment and anger that had been there for a long time. I felt this in Havering. Mainstream politics is responsible for having ignored them too long. As in the United States and France, these sentiments have been ignored and have fuelled populist politicians and populist policies. In Britain, the outcome of the referendum has unleashed them. And like a famous Italian songwriter says: ‘I don’t fear Farage himself, I fear Farage in myself’ – that is to say, when the barriers are broached, it affects us all. This is what I feel it is happening now in our communities. Many say that we need to talk about immigration. Yes, we do. Thom Brooks in his book provides an overarching account of what many feel as Britishness. It is a very important read as it shows how difficult it is to come to terms with this. He goes to core of the issue though – immigration must be controlled and managed, and sentiments of fear will still be left unanswered. As nationalism is on the rise everywhere, we must be vigilant. Theresa May yesterday refused to provide any reassurance to European citizens that Britain welcomes them and will do all they can so that they can stay. I am horrified by the language – deportation of EU nationals. What world do we live in if we talk about deportation? What message is this going to send to our children and to the three year old whose mum just called me saying he was shouted at ‘go home’ at the school gate? Cameron and the Tories with their six years of austerity; Farage with his dangerous rhetoric and Johnson with his populism and lies are responsible for the situation we find ourselves in. But we, in Labour, also have a responsibility. Strong Labour areas have voted Leave and we have to respond to those who feel abandoned and marginalised. We must put our house in order, and reinvent a purpose for the Left in this century – one based on and economic policy with growth, innovation, industrialisation and skills at its heart; a language that speaks of citizens, not customers. A story of national renewal that speaks of Britain at its best. We must do it now, otherwise it will be too late for Labour, and too late for Britain. I suspect the hostility described was pent up resentment about the lack of consent in so many aspects of working people’s lives. Labour could have done so much better had it remembered its roots as Party of thriving democratic values. As it was, the Parliamentary Party in particular thought their job was to decide for people rather than with people. The consequences were an elevated sense of, ‘we know better’. An example of how Labour could have demonstrated its difference on the EU would have been if the MEPs behaved a little differently. They could have conducted at least some intense ground work in working class areas of the UK. No wonder no one knows who they are. Instead many opted for ‘jollies’ on visits to S.E Europe to see whether they were, ‘up to scratch’ – what the hell are they going to learn from that. One consequence is taking people for granted, an example showing in Scotland. The opposition to a referendum offered by the Tories was just a symptom. A repeat is demonstrated by Kinnock’s in contrivance an interpretation of the Leader as just a another candidate in the attempt to keep him off the Ballot paper. Even if we oppose Corbyn the automatic rush to minimise engagement and democracy is example of a style that lost for Kinnock and others. Labour really does need to change if it is captured 2/3 of its previous support never mind move ahead.